Rabat (VNA) – Vietnam always places importance to developing the friendship and multi-dimensional cooperation with African countries, seeing Morocco as her prioritized partner in North Africa, Chairwoman of the Vietnamese National Assembly Nguyen Thi Kim Ngan said. 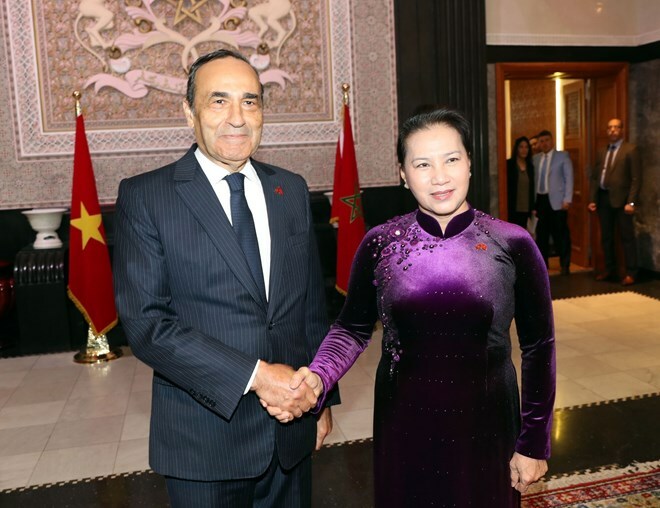 The Vietnamese leader made the statement at her talks with Speaker of the Moroccan House of Representatives Habib El Malki in Rabat on March 28, during her official visit to Morocco. The Speaker spoke highly of the new development of bilateral ties, saying the similarity in geographical position, -- Vietnam as a gateway to Southeast Asia, and Morocco as a gateway to Africa -- would provide conditions for the two countries to look into opportunities and possibilities to step up their ties. He thanked Chairwoman Ngan for inviting Morocco to attend APPF-26, describing it as a step to realize a cooperation agreement signed by the two sides. Ngan said her visit aims to step up and deepen the friendship and multi-faceted cooperation between the two countries in general and the two law-making bodies in particular. The Vietnamese delegation is comprised of some Government members who will sign four cooperation agreements between ministries and localities. The documents are expected to exert positive impacts on the bilateral ties. Ngan shared the host’s view about the sound political ties between the two countries, expressing her wish to welcome the King of Morocco to visit Vietnam in the coming time to discuss bilateral cooperation as well as enhance solidarity and mutual understanding between leaders and people. She took the occasion to thank Morocco for its support and coordination at multilateral mechanisms, affirming Vietnam’s continuous support for Morocco at international forums. Ngan expressed her hope that as a member of the African Union (AU), Morocco will help boost the relations between Vietnam and the AU as well as the early establishment of official relations. She pledged that Vietnam is willing to act as an important bridge for the relations between Morocco and other ASEAN countries. Host and guest agreed that the two countries will increase the exchange of visits, especially high-level ones, and continue working closely at regional and international forums, especially that in the UN, Francophonie, and the Non-Aligned Movement. The countries will continue coordinating closely in bringing into full play the efficiency of the joint committee and political consultations while enhancing locality-to-locality ties towards setting up cooperative relations and twinning ties between Ho Chi Minh City and Casablanca, Da Nang and Tangier, and Nha Trang and Agadir. Regarding economic cooperation, Ngan said trade ties between the two countries remain modest, standing at 212.7 million USD in 2018, noting the figure did not match potential and expectations. In order to further bilateral economic ties, Ngan suggested connecting the two countries’ business communities, especially business associations in the promising fields of trade, tourism, and finance towards establishing a Joint Business Council. On regional and global issues of shared concern, Ngan affirmed Vietnam’s consistent stance on the peaceful settlement of sovereignty and territorial disputes on the basis of respect to international law and the United Nations (UN) Charter, including the 1982 UN Convention on the Law of the Sea. On ties between the two legislatures, she affirmed that parliamentary cooperation is one of the effective channels in Vietnam – Morocco ties, making important contributions to stepping up bilateral multifaceted partnership. Ngan lauded the two law-making bodies for sharing professional experience; maintaining exchange, consultation and mutual support at multilateral forums such as the Inter-Parliamentary Union (IPU) and the Francophone Parliamentary Assembly (APF). She thanked the Moroccan House of Representatives and its Speaker for stepping up ties between the Vietnamese NA and Asia-Pacific parliamentary cooperation mechanisms via sending high-ranking delegations to conferences held in Vietnam and ASEAN member states. On the basis of bilateral cooperation agreement signed in 2017, she proposed that the Vietnamese legislature and the Moroccan House of Representatives should boost the sharing of experience in the making of law and parliament governance. The guest asked for enhancing the exchange of high-ranking delegations to raise mutual understanding and trust among parliamentarians, friendship parliamentarians’ groups and committees; working closely together to monitor the implementation of agreements signed between the two governments, ministries and agencies, as well as multilateral forums such as the IPU, the Asia-Pacific Parliamentary Forum, the APF and other inter-parliamentary organisations.